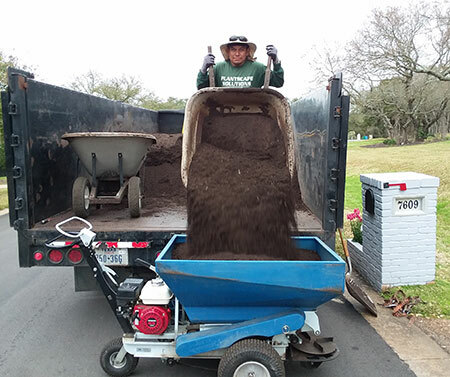 Top Dressing in Austin, TX: Like Organic Steroids for Your Lawn! 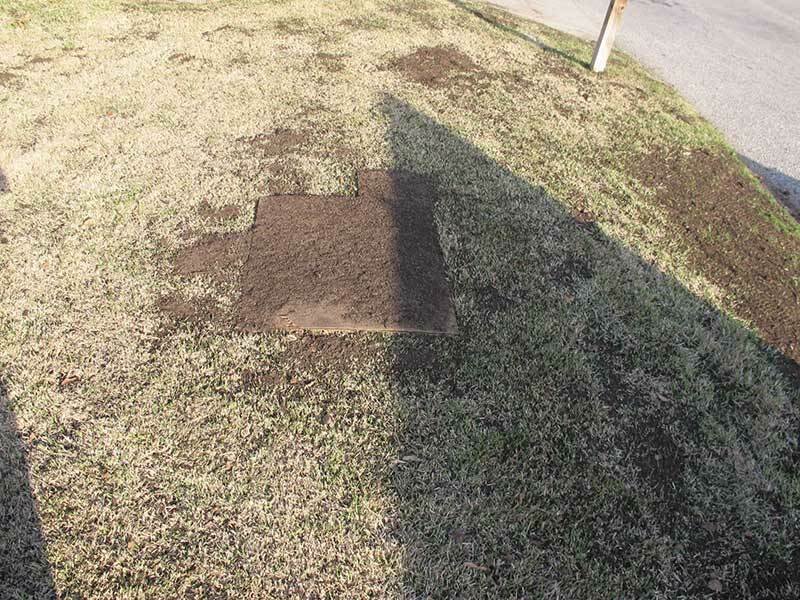 Whether lawns are Bermuda, Zoysia, St. Augustine, or Buffalo Grass it will benefit from being top dressed with a high quality compost material. Top dressing can keep lawns looking great or save a lawn on the brink of needing to be re-sodded. All turf types depend on a symbiotic relationship with microbial activity in the soil to survive. This microbial activity lives in the root network of all lawns to some extent. 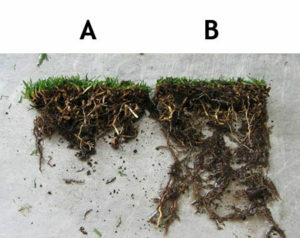 In turf root systems with low levels of microbial activity the grass will struggle to get enough water and nutrients. 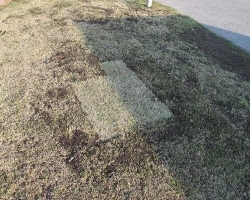 Sometimes in spring a lawn may look a little better but once the weather heats up and the stress level on the grass increases more problems always arise. 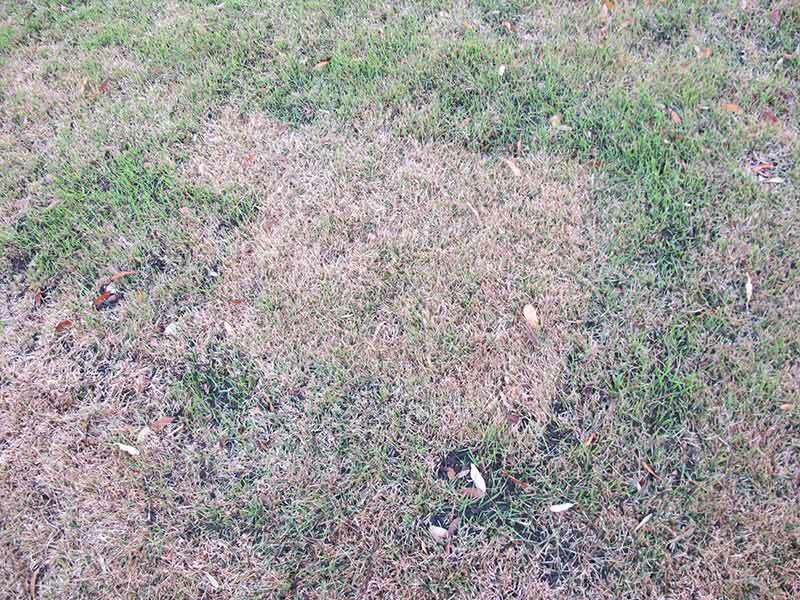 Often the growth rate of turf in poor soil will decline no matter how much it is watered or fertilized. The color will often get a slight or moderate tinge of yellow and there may be patchy areas where the lawn grows slightly better surrounded by areas with anemic growth rates. These are all classic signs of a soil that is low in organic matter and has depleted levels of beneficial microbial activity. 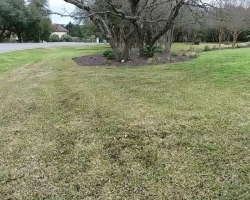 See Our Lawn Top Dressing Process in Action! Our top soil machine delivers clean results! Top dressing which consists of composted organic matter and sand does not directly help lawns the way one would think. The lawn roots do not directly benefit much from organic matter. The organic matter is really intended as a food source for the beneficial microbial activity in the soil and root zone. This activity lives in the root system of the lawn and all living plants. When a lawn is top dressed it is really feeding the beneficial microbial activity in the soil and not the root network directly. This microbial activity allows the root structure in the lawn to grow much larger and become a more efficient nutrient and water extracting mechanism. The microbial organisms actually extend the reach of the root system in a symbiotic relationship and allow it to extract water and nutrients from tiny particle of soil that roots could not reach otherwise. The microbial colony surrounds the root structure and also helps protect it from pathogens in the soil. The microbes extract a tiny amount of carbohydrates out of the host plant for energy but do it no harm. A.) This is typical of the root structure found in many of our central Texas lawns that are growing in a depleted clay Chocolate Loam soil with low amounts of organic matter. There is microbial activity present but at very low levels. B.) This is typical of a root structure that would be found in amended soil with more organic matter present. Top dressing material contains a high level of organic humus matter which provides a food source for the beneficial microbes that occur naturally in soil. The microbes and root network flourish together in a symbiotic relationship that creates a vastly enhanced root network. The stronger root network can now reach further out into the soil to extract more water and nutrients. The microbes are also able to get into small particles of soil and extract water and nutrients that the roots could not get to otherwise. For lawns with no history of health issues like anemic growth, lack of color, poor density, or similar issues the application of half of a yard per 1000 square feet of top dressing works great. For lawns with a history of issues or that were damaged in the past by a lack of water, Chinch Bugs, or other issues a heavier rate of three quarters of a yard per 1000 square feet of material is recommended. For people who want to make their lawn even more robust and healthy many chose to make their first application the more potent three quarters of a yard application and then follow it up the following years with a half yard application per 1000 square feet. In very rare instances where sandy loam was present in the soil one cubic yard of top dressing was applied per 1000 square feet and three quarter yard applications were done the following years. 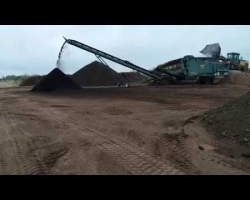 The top dressing material used by Plantscape Solutions consists of 80% composted material and 20% fine washed sand. There is no Dillo Dirt or any manure in the mix. This makes it suitable for use on properties along Lake Austin, Lake Travis, Barton Creek, or any where that runoff into water ways could be a concern. The material is screened down to a small ¼” size to allow it to easily sift down through the lawn to the soil where it belongs. The fine sand also adheres to the compost material allowing it to resist floating in heavy rain events. The material is made by Master Gardener Phil Gosh specifically for Plantscape Solutions to certain specifications in a custom blend. Phil is a member of the US Composting Council as is Plantscape Solutions owner David Prew. 20% fine sand in the mix works to break up the tight clay bonds in the soil that bind the particles close together. Clay consists of tiny particles of highly decomposed organic matter. Clay particles tends to form tight bonds that make it difficult for water to be absorbed or stored in the soil. The sand helps break up these tight bonds in the soil and allow water and beneficial oxygen to better infiltrate the soil. Organic matter stimulates the microbial activity which allows the lawn to better extract nutrients and more water from the soil. This allows the lawn to also survive with less irrigation because the root networks now has the ability to extract more water from the soil. The organic material creates water holding voids in the soil that act like tiny sponges. This allows the soil to better hold and conserve water. This translates into the need to water less. Density of all types of turf will increase by top dressing. Common Bermuda has been known to double in density and resemble Tif Bermuda more then common. 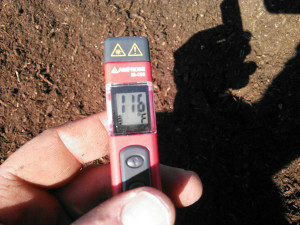 Thicker turf better shields the soil from the sun and minimizes evaporation. Growth rates of all types of grass will increase by top dressing. This makes it harder for weeds to invade. This is especially true in Bermuda lawns. This decreases the need for herbicides to control weed issues. Restores the organic material in the soil and naturally occurring nitrogen depleted by synthetic fertilizers. 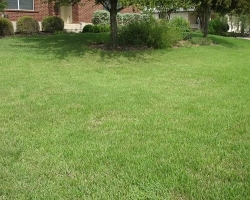 Environmentally friendly way to naturally fertilize your lawn without causing any problems for sources of drinking water such as lakes, creeks, or the Edwards Aquifer. 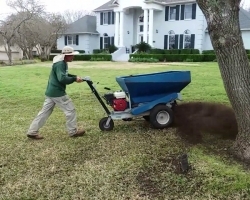 Lawn top dressing also helps trees that share the same soil environment with the lawn. For trees with health issues top dressing is a great way to boost a trees vitality. Improves the effectiveness of organic or traditional synthetic fertilizer absorption by the root network. This can lead to the need to use less fertilizers. Over fertilizing with manmade fertilizer is never good because it depletes the organic material and naturally occurring nitrogen in the soil. It can also cause the buildup of salts, phosphates, and other elements in the soil that can rise to a toxic level. Aeration yields benefits when done on sports fields that have engineered soil that contain organic material and sand that has been compacted by high traffic. 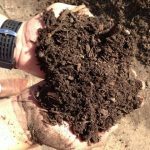 That type of soil does not bind together like the clay chocolate loam or denser underlying clay found deeper under every lawn in central Texas. 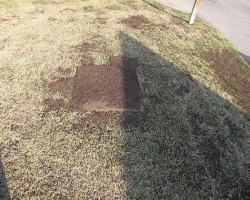 Aerating the loam soil found under lawns in the Austin area is not going to alter the soil characteristics. It remains a clay soil with tiny particles that stay tightly bound together. Now it just has aerator holes that will yield no measurable benefit and money was wasted to create those holes needlessly. There is not a single company in Austin that sells residential aeration services that has information on their website showing any aeration trials or experiments that have yielded results. It is simply a service preached to make companies money during the slower winter months. It is not a service that is done to the benefit of customers. 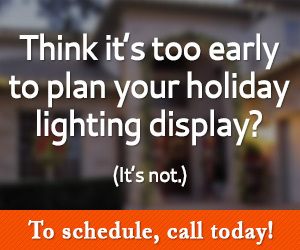 Really it’s not that much different then the companies who convince customers chopping up Crepe Myrtles is a needed and beneficial service. 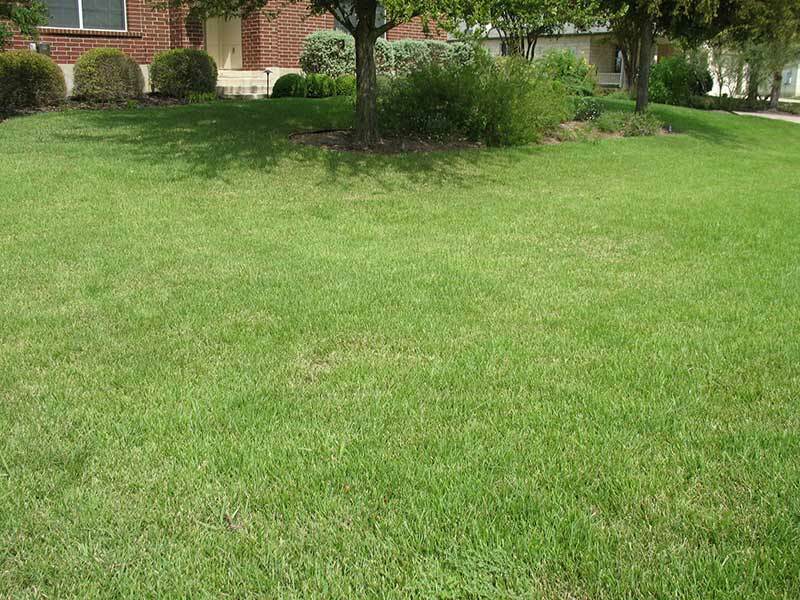 Top dressing causes the root network of the lawns to grow to often be double or more the size. This root growth coupled with adding sand and compost to the soil creates aeration the natural way. The root growth displaces soil and aerates in the process. 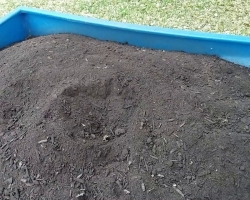 The sand in the top dressing helps break up the tight clay bonds in the soil and in conjunction with the compost it creates voids in the soil that help aerate it. Allowing Mother Nature to aerate your soil for free is really the way to go. The results are not smoke and mirrors and will be long lasting. Another major difference between Plantscape Solutions and the material used by other companies is how it is composted. Most places use material from Whittlesey that is made using the flash composting process. This process takes yard waste and turns it into compost in as little as 4-6 weeks. Phil Gosh uses Mother Natures natural process called the static pile method. This method takes about one year to slowly and carefully turn material into compost by cooking it at temperatures of about 180 F for months at a time. This more thoroughly cooks the material and rids it of any pathogens. The material is to ready use and requires no filler ingredients like loam used by some companies which contains lots of Nutsedge seed and yields no benefit. Material temperatures in our trailer when loading often exceed 100F because the material is teaming with microbial activity that gives off heat as a byproduct. We Do Not Use Dillo Dirt! The top dressing mix contains no Dillo Dirt or manure. This insures no odor issues often found with Dillo Dirt or other companies products that contain manure. The Plantscape Solutions material has naturally occurring nitrogen from the foliar material that was introduced into the composting process. You get a great spring green up minus the odor. If you are trying to be environmentally friendly with your life choices then top dressing fits that mantra perfectly. Some people are squeamish about Dillo Dirt and don’t like the thought of what they flushed down the toilet ending up on their property. To have a single product that appeals to everyone we avoid the use of Dillo Dirt. The goal of top dressing annually is to keep increasing the organic content of the soil year over year. The benefits and residual effects of top dressing can easily exceed twelve months. The goal of annually top dressing is to prevent the beneficial effects from fading away. We want to build on the soils improved organic content with each annual application. There is a zero percent chance of ever having too much organic material in your soil. The U.S. Composting Council’s goal is for soil to have at least 5% organic matter and that goal takes time to achieve. Both Plantscape Solutions and Organics By Gosh are members of the U.S. Organic Council and strive to deliver the best product possible. Here is an experiment done to clearly show top dressing delivers results. 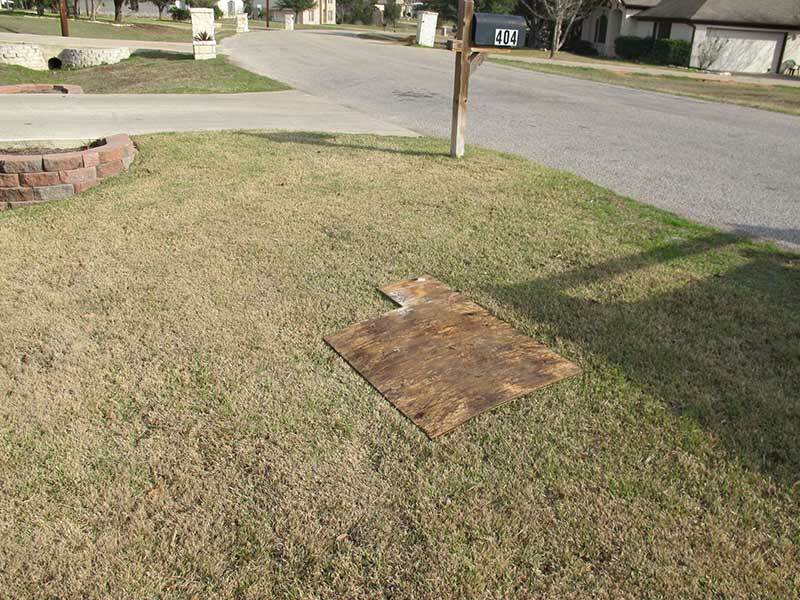 The pictures below show in step 1 how a section of the lawn was covered with plywood so no top dressing was applied to the test area. 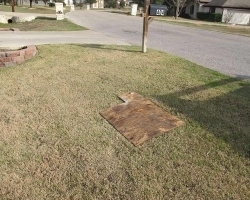 Step 2 shows the area after top dressing and step 3 shows the exposed untreated area after the plywood was removed. Step 4 shows how the grass looks a few weeks later. The experiment was done in March while the lawn was still dormant. You can clearly see how the top dressing application caused the lawn to start to green up while the untreated area clearly showed no signs of coming out of dormancy. 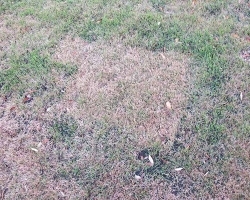 The step 5 picture shows how the lawn looks in the heat of summer months later after seven days with no irrigation. This particular lawn has been top dressed every year with a 3/4ths yard of top dressing per 1000 square feet.